Albatros DIII continues Osprey’s new series Air Vanguard in the skies of The Great War. It features a great detail of information concisely packed into 64 pages including detailed aircraft information, pilot narratives, full color artwork, illustrations, and cutaway art. ” Give me this aeroplane to fight the war. Let me keep the Sopwith Scout to enjoy myself in the air when the war is won.” So wrote a Sopwith Pup pilot after flying a captured Albatros D.III, the version of the Albatros in which the “Red Baron”, Manfred von Richthofen, excelled with long before he became legendarily linked with the iconic Fokker Triplane. The Albatros was a revolutionary jump forward in aerodynamics, powerplant, construction, and firepower. This sleek fighter restored air superiority to Germany after their horrible summer during which Allied fighters ended the ‘Fokker Scourge’ and ravished German air operations. This book chronicles the design, building, testing, development, employment, and modifications of the fighter that executed the aerial slaughter the Allies called “Bloody April”, and then held the line against superior Allied types until German could again field competitive fighters. The D.III was a major redesign of the biplane D.I and D.II versions, being a sesquiplane like the famous French Nieuport. Mr. Miller includes a good deal of fascinating and little known information about the Albatros D.III, expanding and complimenting the previous Air Vanguard title concerning the D.I and D.II. The book starts with an overview of the D.III pedigree and progression with the D.I and D.II. He discusses the methods of constructing the birch fuselage shell, illustrates how it was joined to create the airframe, and reveals methods to protect and color the wood without paint. The Albatros D.III went through four wing designs and those are explored. “Basket weave” construction is examined. He explains the German and Austrian serial number systems applied to aircraft. The D.III suffered serious wing-failure problems early on. The structural and performance deficiencies of the German-built Albatros D.III (Johannisthal, OAW - Ostdeutsche Albatros Werke), are contrasted with the Austrian machines and (Oeffag - Oesterreichische Flugzeugfabrik Allgemeine Gesellschaft), and against the other. He does not stop there! Ever sought the differences between weight tables and sprung footsteps of the manufacturers? That is covered. Why do some have spinners and why are some sans spinner yet with a rounded nose? Why might you see both rounded and straight-edged rudders ? Who were the manufacturers of Albatrosen and their relationship to each other? Unique characteristics of the Albatros’ heart – the Mercedes D.III in-line engine – are explored, with nomenclature and a detailed description of the engine design. Variations in cooling systems for the engine are included. As are the different camouflage and finishes applied by Johannisthal, OAW (Ostdeutsche Albatros Werke), and Oeffag (Oesterreichische Flugzeugfabrik Allgemeine Gesellschaft) . I am still trying to absorb the different variants! Happily, the author presents this detailed information in an easily read and understandable manner. Eighteen pages are devoted to operational history of the fighter with German Jastas and Austro-Hungarian FliKs. Manfred von Richthofen’s story is prominent in this book, as is his brother Lothar, plus other German aces. One ace, Werner Voss, receives four pages of discussion, mostly concerning his unique personal markings. Who knew his wreath was so artistic? Furthermore, Mr. Miller includes the story of the von Richthofens escorting their friend Voss back to his unit, the trio coming upon and engaging eight RFC fighters! Give me this aeroplane to fight the war. Let me keep the Sopwith Scout to enjoy myself in the air when the war is won. A lengthy account by Lothar von Richthofen details how he and his brother were attacked by five RFC fighter and separated, Lothar vanquishing one only to return to save his brother the other four more – with jammed guns. Finally, the story ends with the MvR’s later assessments of the Albatros and the war situation in the summer of 1917. It supports the author’s post-flight reflections of the D.III. The book is not perfect, it has a typo (a date) on page 51. 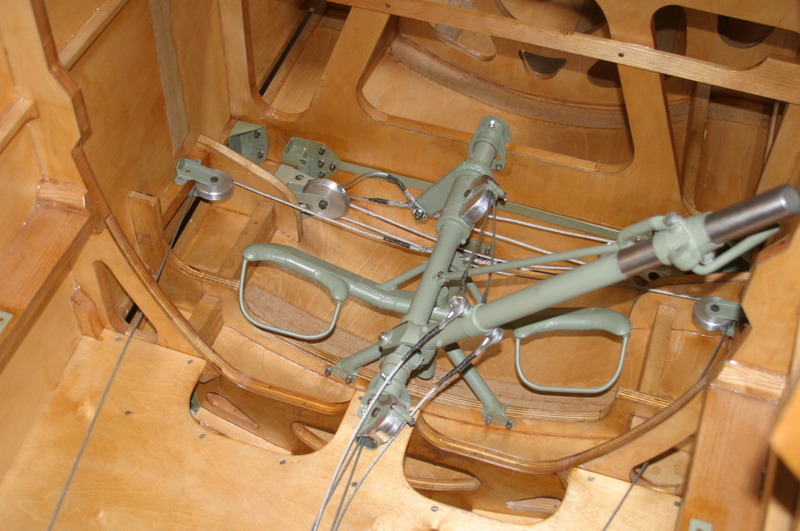 Images clearly reveal the wood grain or metal working on airframe components. Close-ups of the landing gear and tail skid are particularly clear for modelers’ benefit. All photos include a caption or informative sidebar. a. Three Aces The 2 September 1917 event when Manfred and Lothar von Richthofen were escorting their friend Werner Voss back to his Jasta 2, and encountered eight RAF Sopwiths, which they engaged. b.	Balloon-busting The 9 September 1917 balloon kill of Oblt Erich Löwenhardt, Germany’s third-highest scoring ace. A separate color illustration depicts a scarf joint - joining sections of the molded birch panels to create the strong fuselage joints. The final informative illustration is the back cover foldout: Albatros D.III, a cutaway with 34 components keyed to it. One table presents technical specifications of the D.III by manufacturers Johannisthal, OAW, and Oeffag Series 53, 153 and 253. Others present engine specifications of both the Mercedes D.III (D-1466) and the Austro-Daimler 200Ps engines. For modelers and historians this lucky 13th title of the new Air Vanguard series is wealth of information concerning what many German pilots considered the ultimate model of Albatros. While Oeffag improved the D.III type into a serious threat against even later Allied types, subsequent German-built designs failed to fully rectify performance deficiencies against newer Allied types, nor did they fully solve the weak lower wing problem. I found this book to be a fascinating story of the refining of one of the Great War’s iconic fighters. It is not meant to present the war record of every D.III Jasta. Once again I am very impressed with just how comprehensive the text is despite Osprey’s 64-page format constraint. In this title I find the level of detail to be much more than simply sufficient. It is very well written and easy to follow. I greatly appreciate the detail paid to the propeller types, radiators, wing attachment and fuselage structure. Now I want to build model Albatros D.IIIs – Johannisthal, OAW, and Oeffag! Descriptions of flight characteristics and powerplant control is always welcomed by me as it is probably be the closest I’ll ever get to flying an Albatros. Like the previous Albatros title, excellent supporting photographs and art and graphics are superior to what I expected. The editor provided a fine selection of airframes and appliances representing the types. The “in-action” artwork is captivating and inspires me to head back to school and become a GCI artist! With Albatros D.III Osprey continues this excellent series with this anxiously awaited topic. It is a solid resource and offers a wealth of ideas for modelers. I heartily recommend it to enthusiasts of the Albatros and WW I fighters. Images courtesy of Osprey Publishing. Highs: A great deal of technical detail that differentiates between the several variants of Albatros D.III fighters. First-person accounts of fighting with - and against - Albatros. An outstanding review; makes me want to spend some money. I've seen the authors Albatros artworks posted here and there. He's meticulous on the subject. Keith, if you're speaking of the aileron control wires, it was only the D.V which had them routed through the upper wing. All other variants used the lower wing as shown in the cutaway.